Red Sovine would have been 94 years old this month, so I thought it would be appropriate that I post a tribute record from a Pueblo artist this time around. Not a lot of info on this one. 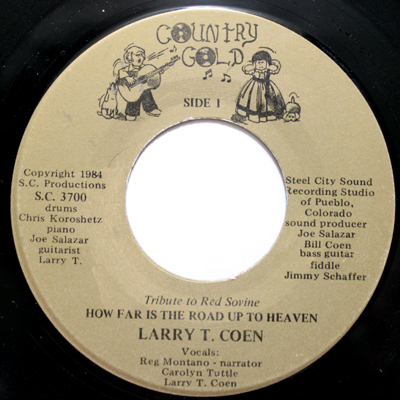 Actually tracked down the family of the singer, Larry T. Coen, but they declined to talk about him, or his music. I always hate it when I hit a brick wall - especially on a record this fabulous. Listen to "How Far is the Road Up to Heaven"
Larry's ode to Red was recorded in 1984 (Red Sovine died in 1980), at the Steel City Sound Recording Studios, in Pueblo. Joe Salazar produced the disc, and played keyboards, Bill Cohen (I'm assuming is some kin) played bass, while Jimmy Schaffer handled the fiddlin' duties. Other credits include Chris Koroshetz on drums, while Larry is on guitar. Reg Montano is credited for the narration. Larry, along with Carolyn Tuttle are labeled as the vocalists. Carolyn gets her own shot to standout, with the flip-side of the recording. Is it just me, or does this sound completely out of place (in a good way) for 1984 country? I mean 1984 was saturated with Alabama, Reba, and Hank Williams Jr.'s "All My Rowdy Friends..." God bless Carolyn for not going down that path. Unfortunately, reaching out for info on her has resulted in no additional information.